It’s not a shock to anyone who knows me that I am a Texas Rangers fan. However, this post is a little off the beaten path for me. I noticed for the first time during last season’s MLB playoffs that I could not log in to Twitter or Facebook during the Rangers game. I blamed it on my 3 year old iPhone. Well now I know the real answer with data to back it up. CNN Money posted an article about why you can’t get wireless service at sports games. With help from app maker SwayMarkets, we now have research showing the best and worst times to access your cellular data service during a Major League Baseball game. The company’s founders went to Fenway Park on May 31 to catch a Red Sox-Tigers baseball game, armed with iPhones on three different wireless phone networks: AT&T, Verizon and Sprint. Using SwayMarkets’ CarrierCompare software, they constantly pinged the various providers’ networks to measure their speed and response times. The results were revealing. And very, very bad. Sprint (S, Fortune 500) and especially Verizon (VZ, Fortune 500) became so overwhelmed that their wireless networks were practically unusable throughout most of the game. Verizon actually had several network failures during the game, meaning download requests simply weren’t able to go through. AT&T’s (T, Fortune 500) network was the only one that worked from start to finish, but its performance was still dreadful. Download speeds during the baseball game dropped to a third of what they were just minutes before and after the game. Refreshing Twitter or Facebook, which took about 6 seconds before the game’s start, took more than 20 seconds at the worst points and sometimes failed outright. The most interesting information in the article relates to the times that service became the most dreadful. Since the researchers went to a Red Sox-Tigers game at Fenway Park, much of it had to do with how well the Red Sox were playing. Network performance on all three carriers fell through the floor as people filed into their seats just before the 7:10 p.m. start time. They were texting, calling, uploading photos to social networks — everything you’d expect people to do when there’s not much going on. Then, as people got into the game, they used their phones less and service got progressively better. The Red Sox quickly took the lead in the second, and lost it in the third. (That’s not surprising if you’ve been following the Sox this year). In the bottom of the third inning, just after the Red Sox tied it up again, Tigers catcher Alex Avila took a foul tip off his facemask, knocking him out of the game. During the extended injury timeout, people flocked to their phones, and service slowed to a crawl. The speeds on AT&T’s network plummeted to less than half its gametime average. Verizon and Sprint’s networks virtually crashed, with speeds sometimes falling below 100 kilobits per second. If you’re older than 25, think about dial-up modem speeds. That’ll give you an idea of how slow the wireless networks were. But when the seventh inning stretch hit, people went right back to their phones, and wireless service quality plunged. A pitching change one batter into the bottom of the seventh led to another short bout of degraded service. Detroit scored another run in the top of the eighth, gaining a two-run edge over the Sox, and many of the Fenway faithful started to lose hope. As they filed out, service dramatically improved. After the Tigers scored another two runs in the top of the ninth inning, taking a 7-3 lead and thoroughly dispiriting the remaining fans, service almost returned to normal. 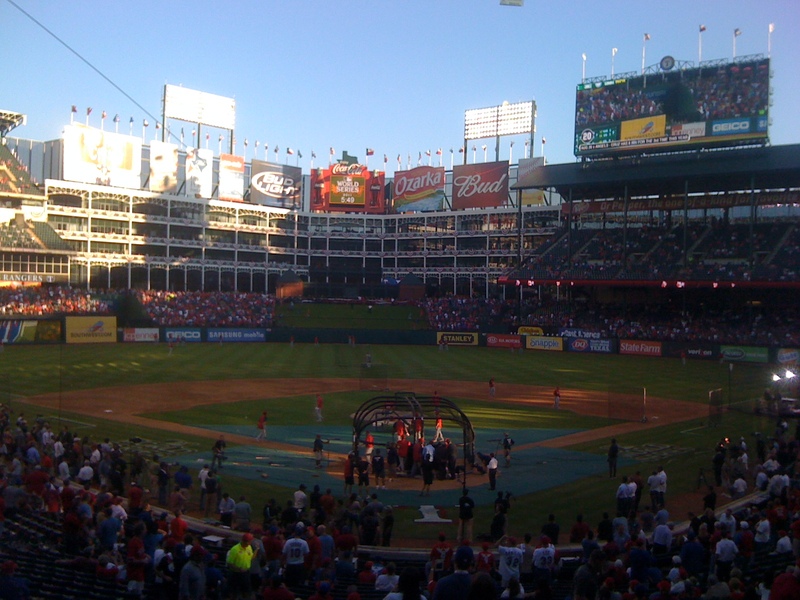 Tonight I’ll be spending a few hours with 45,000 of my closest friends at Rangers Ballpark in Arlington. Hopefully, I’ll be able to get a tweet or text out a time or two, but it might be touch and go, especially if Josh Hamilton crushes his 27th homer into the upper homerun porch. Since Rangers fans are more loyal than BoSox fans, we won’t leave the stands early no matter what the score. However, I fully expect to see the Rangers win, and I’ll tweet once I am safely back at the house.